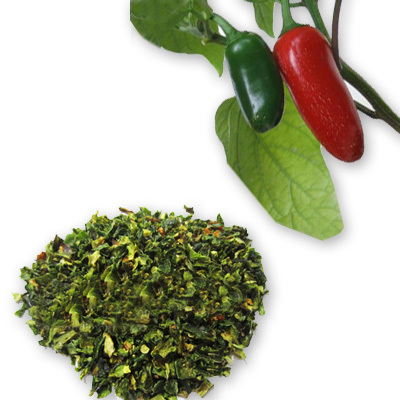 Did you know that jalapenos are named after the capital of Veracruz, Mexico? Jalapa. Though very spicy, the jalapeno is a favorite among chefs because it can be seeded very easily and the seeds and membranes, of course, are what add so much heat. The flesh of the pepper is spicy but not searing. Even with seeds and membranes intact, jalapeno chiles only have a medium heat, nestled somewhere between poblano and serrano chiles. Jalapenos are the perfect size for bite-sized appetizers, but still roomy enough to fill with stuffing. Fresh jalapenos are great stuffed with cream cheese and shrimp, wrapped in bacon and then fried. They're also ubiquitous in Mexican cuisine and its sauces. Pickled jalapenos are milder in flavor, and are commonly added to sandwiches, dips, etc. In the American Southwest, pickled jalapenos are typically offered as a condiment almost everywhere, including fast food chains.